By using, accessing, or purchasing from this website (“Site”), which is owned and operated by Dungeon In A Box (herein referred to as “Dungeon In A Box” or “DIAB”), you acknowledge that you have read, understood, and agree to the following Terms of Service (“Terms” or “Agreement”). If, at any time, you do not agree to these Terms, please do not use this Site. DIAB reserves the right to revise these Terms at any time by updating this posting. Please read and review these Terms periodically. As a condition of your use of this Site, you agree that you are at least 18 years of age or are visiting the Site under the supervision of an adult or guardian and that you possess the authority to enter into a binding legal agreement. We grant you a personal, limited, non-transferable non-exclusive, license to access and use the Site via a browser. We reserve the right to revise the products and services available on the Site and to impose rules for and limits on use of the Site or to restrict your access to part, or all, of the Site without notice. We reserve the right to revoke your access at any time for any reason, including as a result of a violation of these Terms, without notice. We may assign you a password and account identification to enable you to access and use certain portions of this Site. Each time you use a password or identification, you will be deemed to be authorized to access and use the Site in a manner consistent with these Terms and Dungeon In A Box has no obligation to investigate the authorization or source of any such access or use of the Site. You are solely responsible for protecting the security and confidentiality of the password and identification assigned to you. You shall immediately notify Dungeon In A Box of any unauthorized use of your password or identification or any other breach or threatened breach of this Site’s security. Monthly crates for Dungeon In A Box subscriptions are shipped to your address at the address you provided. You may receive emails regarding your account or promotions for special offers, including third party offers. You can cancel your membership anytime without charge by contacting Customer Support. Please refer to the Contact Us section of the Site for further details. 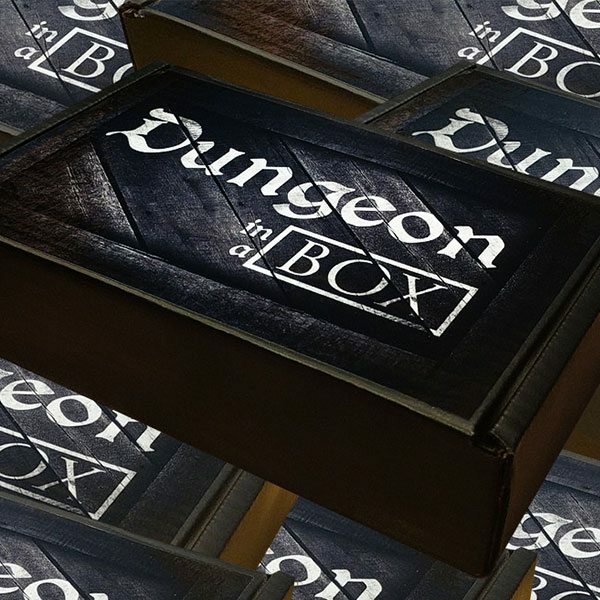 By starting your Dungeon In A Box subscription and providing or designating a payment method, you authorize us to charge you on a recurring monthly/3-monthly/6-monthly/12-monthly (depending on your chosen subscription package) subscription fee at the then current rate. We reserve the right to adjust pricing for our subscriptions in any manner and at any time as we may determine in our sole and absolute discretion. Except as otherwise expressly provided for in these Terms of Service, any price changes to your subscription will take effect following email notice to you. In an effort to get boxes to our subscribers as soon as possible, we begin processing shipments prior to the signup cutoff. As a result, all address updates must be made within 48 hours prior to the subscription renewal date (see “Your Subscription Contract” below for renewal date information) to ensure they are correctly reflected on your shipment. Our shipping service does not include the forwarding with your mail to an updated address. Any forwarding fees incurred will not be reimbursed or credited to your subscription. BY PURCHASING ANY SUBSCRIPTION, YOU ACKNOWLEDGE THAT YOUR SUBSCRIPTION HAS AN INITIAL AND RECURRING PAYMENT FEATURE AND YOU ACCEPT RESPONSIBILITY FOR ALL RECURRING CHARGES PRIOR TO CANCELLATION. YOUR SUBSCRIPTION WILL BE AUTOMATICALLY EXTENDED FOR SUCCESSIVE PERIODS, AT THE THEN-CURRENT SUBSCRIPTION RATE. TO CANCEL YOUR SUBSCRIPTION AT ANY TIME, YOU MUST DO ONE OF THE FOLLOWING AT LEAST 48 HOURS PRIOR TO YOUR NEXT SCHEDULED RENEWAL DATE TO AVOID CHARGE: UPDATE YOUR USER ACCOUNT AT DUNGEONINABOX.COM OR EMAIL SUPPORT AT [email protected] IF YOU CANCEL, YOU MAY USE YOUR SUBSCRIPTION UNTIL THE END OF YOUR THEN-CURRENT SUBSCRIPTION TERM. DIAB MAY SUBMIT PERIODIC CHARGES (E.G., MONTHLY) WITHOUT FURTHER AUTHORIZATION FROM YOU, UNTIL YOU PROVIDE PRIOR NOTICE THAT YOU HAVE TERMINATED THIS AUTHORIZATION OR WISH TO CHANGE YOUR PAYMENT METHOD WITHIN THE 48-HOUR NOTICE REQUIREMENT. The technology underlying, and the entire content included in, the Site, including but not limited to text, graphics or code is copyrighted as a collective work under the United States and other copyright laws, and is the property of Dungeon In A Box and is protected by copyright and other intellectual property or proprietary rights. All rights reserved. We do not investigate to determine if such works are accurate nor can we provide assurance that all such works are free of typographical errors. We cannot guarantee information displayed on this Site to be 100% accurate. All trademarks, service marks, and trade names of Dungeon In A Box on the Site are trademarks or registered trademarks of Dungeon In A Box, or of their respective owners. By sharing, submitting and uploading any of your data (including but not limited to photographs, images, video, music, art, or comments) to DIAB’s website, DIAB’s social media channels (including, without limitation, Twitter (including # and @ comments incorporating Dungeon In A Box), Facebook and Instagram) and pages dedicated to Dungeon In A Box in discussion forums (e.g., Reddit), you grant Dungeon In A Box a worldwide, non-exclusive, royalty-free, sub-licensable and transferable license to use, reproduce, prepare derivative works of, display and perform your user data in any legal manner for the benefit of Dungeon In A Box. You acknowledge and agree that you are solely responsible for all the user data that you make available through such means. Accordingly, you represent and warrant that: (1) you have all rights, licenses, consents and releases necessary to grant Dungeon In A Box the required rights to disseminate any user data, and (2) neither your data nor your posting, uploading, publication, submission or transmittal of this data or Dungeon In A Box use of your uploaded data (or any portion thereof) on, through or by the means of Dungeon In A Box will infringe, misappropriate or violate a third party’s patent, copyright, trademark, trade secret, moral rights or other intellectual property rights or rights of publicity or privacy or result in the violation of any applicable law or regulation. Except as otherwise specifically provided, the site and the products offered on the site are provided on as “as is” and “as available” basis without warranties or any kind, whether express or implied. To the fullest extent permissible pursuant to applicable law, Dungeon In A Box disclaims all warranties, express or implied, including, but not limited to, implied warranties of merchantability and fitness for a particular purpose and non-infringement. Dungeon In A Box does not represent or warrant that the functions contained on the site will be uninterrupted or error-free, that the defects will be corrected, or that the site or the server that makes the site available are free or viruses or other harmful components. 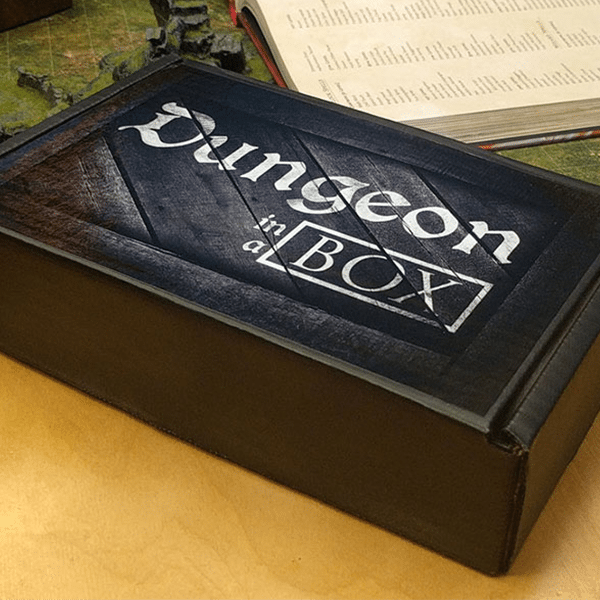 Dungeon In A Box does not make any warrantees or representations regarding the use of the materials on the site in terms of their correctness, accuracy, adequacy, usefulness, timeliness, reliability or otherwise. Applicable Law may not allow limitations or exclusions on warranties, so the above limitations may not apply to you. Neither Dungeon In A Box nor its celebrity spokespersons shall be liable for any indirect, incidental, special or consequential damages that result from the use of, or the inability to use, the site or materials on or provided through the site, even if Dungeon In A Box has been advised of the possibility of such damages. In no event will Dungeon In A Box liability to you exceed the amounts that you paid to Dungeon In A Box in connection with your Dungeon In A Box membership. Applicable law may not allow the limitation of exclusion of liability or incidental or consequential damages, so the above limitation or exclusion may not apply to you. In the event a product is listed at an incorrect price or with incorrect information due to typographical error or error in pricing or product information received from our suppliers, Dungeon In A Box shall have the right to refuse or cancel any orders placed for product listed at the incorrect price.Dungeon In A Box shall have the right to refuse or cancel any such orders whether or not the order has been confirmed and your credit card charged. If your credit card has already been charged for the purchase and your order is canceled, Dungeon In A Box shall immediately issue a credit to your credit card account in the amount of the charge. 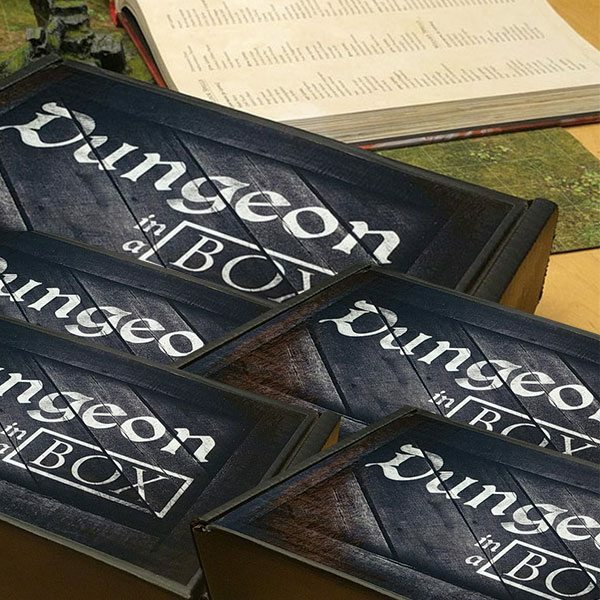 Dungeon In A Box has no liability for injury or damage caused by products within the box. Such liability is the sole responsibility of the product brand or manufacturer. These Terms are applicable to you upon your accessing the Site. These Terms, or any part of them, may be modified or terminated by Dungeon In A Box without notice at any time, for any reason. 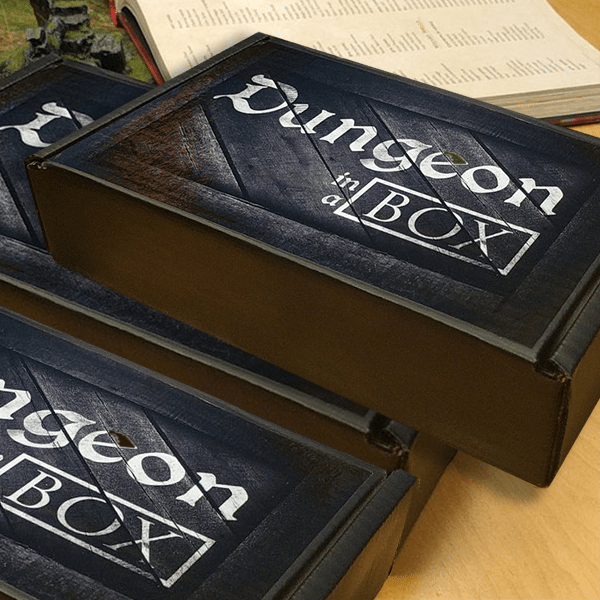 Dungeon In A Box reserves the right to limit discount codes to one per customer in its sole discretion. The provisions relating to Copyrights, Trademark, Disclaimer, Limitation of Liability, Indemnification, and Miscellaneous, shall in all events survive any termination of these Terms and your use of the Site. This Arbitration Agreement facilitates the prompt and efficient resolution of any disputes that may arise between you and Dungeon In A Box. Arbitration is a form of private dispute resolution in which parties to a contract agree to submit their disputes and potential disputes to a neutral third person (called an arbitrator) for a binding decision, instead of having such dispute(s) decided in a lawsuit, in court, by a judge or jury trial. Please read this Arbitration Agreement carefully. It provides that all disputes between you and Dungeon In A Box shall be resolved by binding arbitration. Arbitration replaces the right to go to court. In the absence of this arbitration agreement, you may otherwise have a right or opportunity to bring claims in a court, before a judge or jury, and/or to participate in or be represented in a case filed in court by others (including, but not limited to, class actions). Except as otherwise provided, entering into this Arbitration Agreement constitutes a waiver of your right to litigate claims in court and all opportunity to be heard by a judge or jury. There is no judge or jury in arbitration, and court review of an arbitration award is limited. The arbitrator must follow this Arbitration Agreement and can award the same damages and relief as a court (including attorney’s fees, if otherwise authorized by applicable law). For the purpose of this Arbitration Agreement, “Dungeon In A Box” means Dungeon In A Box and its parents, subsidiaries, and affiliated companies, and each of their respective officers, directors, employees, and agents. The term “Dispute” means any dispute, claim, or controversy between you and Dungeon In A Box regarding any aspect of your relationship with Dungeon In A Box, whether based in contract, statute, regulation, ordinance, tort (including, but not limited to, fraud, misrepresentation, fraudulent inducement, negligence, gross negligence or reckless behavior), or any other legal or equitable theory, and includes the validity, enforceability or scope of this Arbitration Agreement (with the exception of the enforceability of the Class Action Waiver clause below). “Dispute” is to be given the broadest possible meaning that will be enforced. For all Disputes, whether pursued in court or arbitration, you must first give Dungeon In A Box an opportunity to resolve the Dispute. You must commence this process by mailing written notification to Dungeon In A Box. That written notification must include (1) your name, (2) your address, (3) a written description of the Dispute, and (4) a description of the specific relief you seek. If Dungeon In A Box does not resolve the Dispute to your satisfaction within 45 days after it receives your written notification, you may pursue your Dispute in arbitration. You may pursue your Dispute in a court only under the circumstances described below. If this Arbitration Agreement applies and the Dispute is not resolved as provided above (“Pre-Arbitration Claim Resolution”) either you or Dungeon In A Box may initiate arbitration proceedings. The arbitration shall be commenced as an individual arbitration, and shall in no event be commenced as a representative or class arbitration. All issues shall be for the arbitrator to decide, including the scope of this Arbitration Agreement. Because your contract with Dungeon In A Box, the Terms of Service, and this this Arbitration Agreement concern interstate commerce, the Federal Arbitration Act (“FAA”) governs the arbitrability of all Disputes. However, the arbitrator will apply applicable substantive law consistent with the FAA and the applicable statute of limitations or condition precedent to suit. You may initiate arbitration in either Los Angeles, CA, or in the federal judicial district that includes your address that you provide in your written notification of Pre-Arbitration Dispute Resolution. In the event that Dungeon In A Box initiates an arbitration, it may only do so in the federal judicial district that includes your address that you provide in your written notification of Pre-Arbitration Dispute Resolution. Dungeon In A Box will pay all arbitration filing fees and arbitrator’s costs and expenses upon your written request given prior to the commencement of the arbitration. You are responsible for all additional fees and costs that you incur in the arbitration, including, but not limited to, attorneys or expert witnesses. Fees and costs may be awarded as provided pursuant to applicable law. In addition to any rights to recover fees and costs under applicable law, if you provide notice and negotiate in good faith with Dungeon In A Box as provided in the section above titled “Pre-Arbitration Dispute Resolution” and the arbitrator concludes that you are the prevailing party in the arbitration, you will be entitled to recover from Dungeon In A Box your actual and reasonable attorney’s fees and costs as determined by the arbitrator. The parties agree that the arbitrator may not consolidate more than one person’s claims, and may not otherwise preside over any form of a class or representative proceeding or claims (such as a class action, representative action, consolidated action or private attorney general action) unless both you and Dungeon In A Box specifically agree to do so following initiation of the arbitration. Neither you, nor any other Member of Dungeon In A Box and/or user ofDungeon In A Box services, can be a class representative, class member, or otherwise participate in a class, representative, consolidated or private attorney general proceeding. You understand and agree that, by entering into this Arbitration Agreement, you and Dungeon In A Box are each agreeing to arbitration instead of the right to a trial before a judge or jury in a public court. In the absence of this Arbitration Agreement, you and Dungeon In A Box might otherwise have had a right or opportunity to bring Disputes in a court, before a judge or jury, and/or to participate or be represented in a case filed in court by others (including class actions). Except as otherwise provided below, you give up those rights. Other rights that you would have if you went to court, such as the right to appeal and to certain types of discovery, may be more limited in arbitration. The right to appellate review of an arbitrator’s decision is much more limited than in court, and in general an arbitrator’s decision may not be appealed for errors of fact or law. As an alternative to arbitration, you may bring a claim against Dungeon In A Box in a small claims court of competent jurisdiction. Such a claim may be brought in your name only, and not as a class action, representative action, consolidated action or private attorney general action. No small claims court or other court shall have the right to consolidate multiple parties’ claims or award relief to any person who is not a direct party to such small claims court proceeding. This Arbitration Agreement shall survive the termination of your contract with Dungeon In A Box and your use of Dungeon In A Box services. Dungeon In A Box may deliver notice to you by means of e-mail, a general notice on this Site, or by other reliable method. You agree to indemnify, defend, and hold harmless Dungeon In A Box, its officers, directors, employees, agents, licensors and suppliers from and against all losses, liabilities, expenses, damages, and costs, including reasonable attorneys’ fees, resulting from any violation of these Terms, or any activity related to use of the Site (including negligent or wrongful conduct) by you or any other person accessing the Site using your Internet account. Third-Party Links: In an attempt to provide increased value to our visitors, Dungeon In A Box may link to sites operated by third parties. However, Dungeon In A Box has no control over these linked sites, all of which have separate privacy and data collection practices, independent of Dungeon In A Box. These linked sites are only for your convenience and therefore you access them at your own risk. Nonetheless, Dungeon In A Box seeks to protect the integrity of its Site and the links placed upon it and therefore requests any feedback on not only its own Site, but for sites it links to as well (including if a specific link does not work). Miscellaneous: These Terms constitute the entire agreement between you and Dungeon In A Box with regard to your use of the Site. Neither the course of conduct between the parties nor trade practice shall act to modify any of these Terms. Dungeon In A Box may assign its rights and duties under this Agreement to any party at any time without notice to you.